Chair rail serve a simple practical functionality. It shields the walls of your room from denting caused by the back of the chair. The chair rail moldings are fixed twenty four to forty eight inches above the floor area horizontally all across the perimeter of the room. We provide stylish & beautiful chair rail moulding to pull together different areas of a room. Inspired from ancient architectural and period designs, our line of decorative chair rail molding in various significant architectural styles, Floral or Rope motif, creates a distinct look and provides a stylish alternative to typical wood chair rail moldings. You can find a wide assortment of high quality chair rail moldings. These chair rail mouldings will become part of your home’s interior identity for years to come. 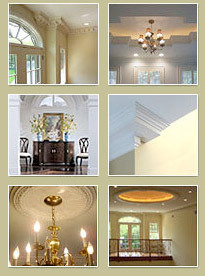 Hire a professional or install it yourself! Please visit the installation guide page on our website to get step by step instructions on how to install moldings.